There are probably about 1,001 great reasons to grow a garden, but one of the most wonderful reasons, I think, is that this time of year you can see yourself some fantastic butterflies. A couple of years ago I went to the bead show in Sylva, North Carolina, for the very first time. I had heard it was good, but then you never know. Now I get so excited going to the bead show every year I am practically hyperventilating the entire two hours it takes to drive there from Atlanta. One year a friend with a really bad flu even got out of bed to come with me. You just can’t beat the bead show in Sylva. They have everything. Rocks, crystals, crystal cathedrals, beads, findings, fossils, and already-made jewelry, from all kinds of countries all over the world. One of the outdoor booths at the Sylva bead show always has butterfly pictures. These are framed pictures that include actual butterflies. I bought one for $35 – an incredible bargain worth all my breathlessness – that had butterflies of literally every color. I marvel at my picture, which I now have hanging against a yellow wall. I am not a butterfly expert and could not name them for you when I see them, but what I do know is that I get about as excited seeing the butterflies in my garden as I do visiting the bead show in North Carolina. You think you have seen ALL the butterflies, but the next one is about as miraculous and exciting as the one before. Just like the bead show, you never get tired of them. Plus they have a mind of their own and do not like to pose for pictures, which makes the act of photographing them all that more challenging. 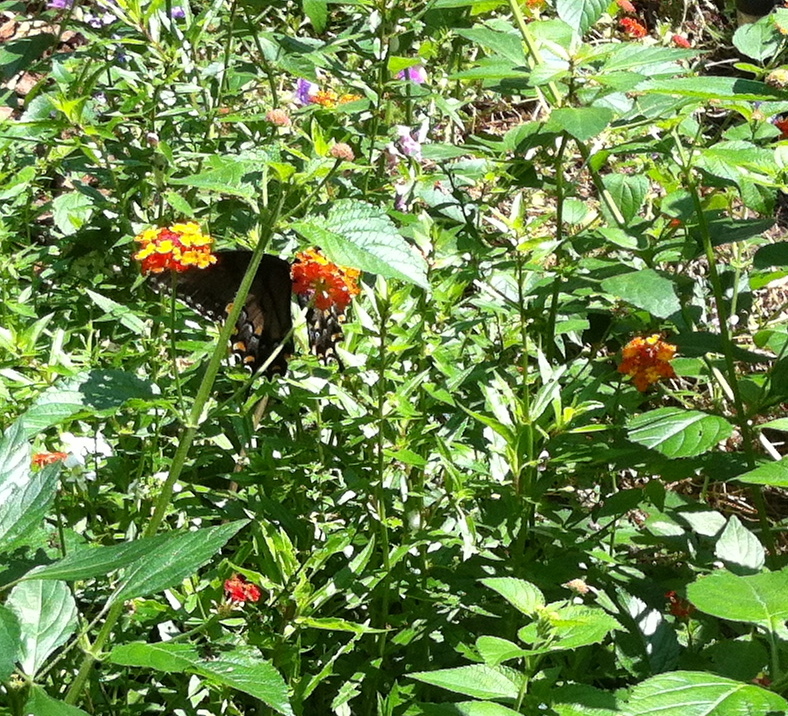 I will be inside my studio doing healing work and then – with my client’s permission, if they don’t mind for a moment – if I see a butterfly I will rush out the door with my iPhone and snap the picture. This frankly does not usually go over all that well, as the butterflies seem to know I am on the way out the door. Maybe it’s my dog Belle barking that tips them off. The photography project seems to work best if I just stand there – when I have time of course – pretending to blend in with the angelonias and lantanas and nonstop pink rose bush, as if I was just another fixture in the garden. Of course you can imagine how this goes over with the butterflies. As if you could put anything past them! But when they get super busy picking off the petals of the lantanas, I can take their portrait while they are otherwise employed and I come away feeling quite victorious. I think this is what joy is all about – finding a moment of pure ecstasy and hanging on to it until it flutters away.